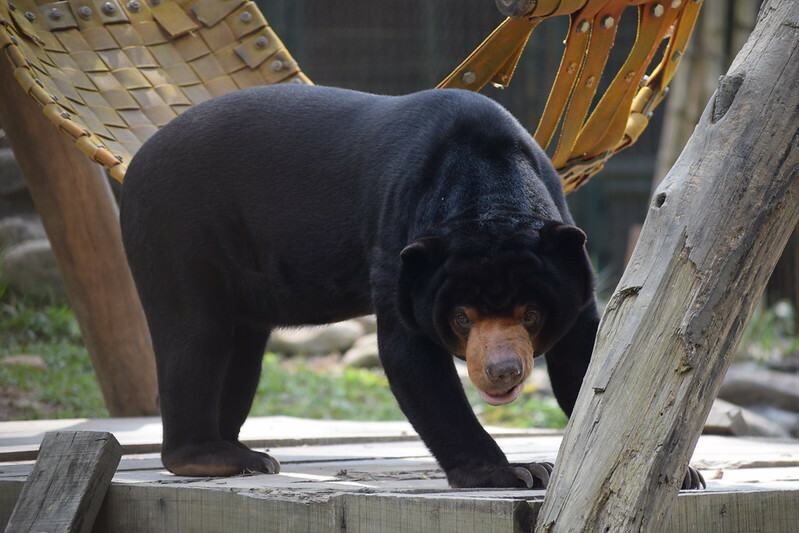 Sun bear Aurora worked up the courage to explore the unknown – finding cool grass beneath her paws, coconuts and even potential new friends. Having been poached from the wild as a tiny cub, sun bear Aurora hadn’t felt grass under her paws for 15 years. Little wonder then that when the door to her new sanctuary home first opened onto an outdoor enclosure, Aurora wasn’t quite sure what to do. As with so many rescued bears, Aurora’s first instinct was to be wary of the unknown. She timidly poked her head out of the den and let her eyes adjust to the sunlight. Then, taking small, slow steps, she stepped out onto the concrete patio and sniffed the strange new environment. In front of her lay a grassy playground full of trees and climbing structures. Scattered throughout the enormous enclosure were irresistible treats including coconuts, jam smears and tropical fruits. Soon enough temptation overcame trepidation and Aurora courageously stepped onto the grass and followed her nose around her new home. “Aurora is the smallest bear in the whole sanctuary, but she has a big heart. She quickly overcame her fears and bravely explored her new home, searching out treats. While bears are believed to be mostly solitary in the wild, Animals Asia has found the companionship of other bears to be an important factor in improved welfare for bears living in rescue centres and sanctuaries. 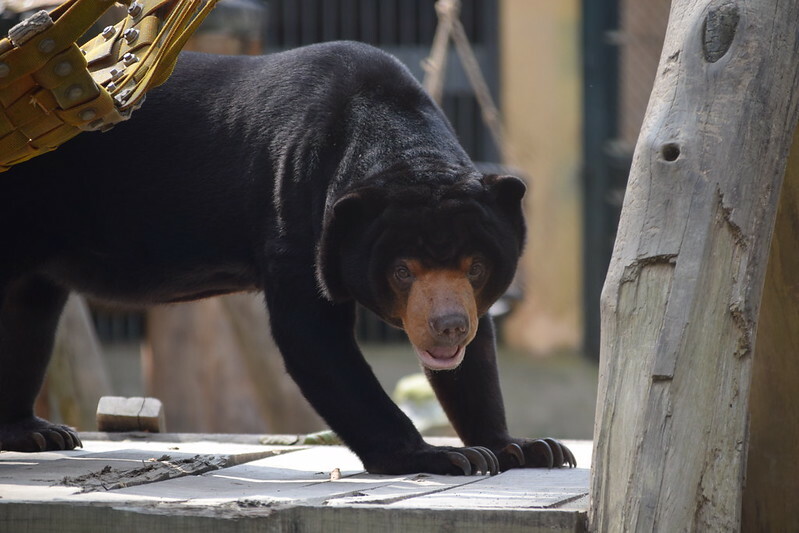 In the near future, attempts will be made to integrate Aurora with some of the other 11 sun bears currently at Animals Asia’s sanctuary. Aurora spent 15 years in a tiny cage having been poached from the wild and sold as an exotic pet. She was rescued by Animals Asia in December 2018 and travelled 1,500 kilometres by road to the charity’s sanctuary in the north of Vietnam. Since her rescue, Aurora has also received a thorough examination by vets who believe she has a small gallstone and suffers from arthritis. Thankfully, neither condition requires surgery or medication currently and will be monitored closely as future treatment will likely be required. Animals Asia is a pioneer in combating the bear bile farming industry. In 1998, it was the first to expose the harsh realities of this once-hidden trade and has since rescued more than 600 bears from the industry in both Vietnam and China. The organization’s Founder and CEO, Jill Robinson, is considered the world’s leading authority on bear bile farming, having dedicated her life to exposing and eradicating this brutal industry for more than 20 years. Today, nearly 200 bears live in peace and tranquility at Animals Asia’s Vietnam Bear Rescue Centre, while 190 more are looked after by the organization in China.